Jeremy Lapedis is a project manager at CHRT. 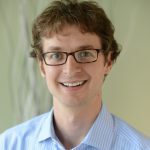 In this role, he works with the Washtenaw Health Initiative to implement the State Innovation Model (SIM), a grant to improve linkages between the the healthcare and social service sectors in Washtenaw and Livingston Counties. Additionally, he provides analysis and analytical support for a variety of health policy, data, and research projects. Jeremy is recently completed (DrPH) Doctor of Public Health from the Harvard School of Public Health. There, he focused on the use of coalitions to integrate healthcare and social services as the healthcare system financing model shifts to reward value and outcomes rather than volume. As a part of his doctorate work, Jeremy designed a complex care management program for Intermountain Healthcare in Utah, developed a financial assistance policy for hospitals with Community Catalyst and wrote a Harvard Teaching Case on the Massachusetts Health Policy Commission. Prior to his doctorate work, Jeremy served as the Program Evaluation Manager at AIDS Action Committee of Massachusetts. Jeremy holds a Master in Science of Public Health degree from the Johns Hopkins School of Public Health, and a B.S. in Neuroscience from the University of Michigan.